Wikipedia is very cool. As of this post (March 19th), the English language wikipedia has about 4.2 million articles written by volunteers. Of these, a little under 1.5 million have geographical information associated with them in the form of geographical coordinates. For example, on the article about UCSC if you look in the upper right hand corner, you’ll see a small bit of text displaying the geographical coordinates. There’s a whole group of people on wikipedia dedicated to adding this information to articles. And they’ve done a great job. I happened to stumble upon a very useful data dump created by someone with the account name “dispenser” on the wikimedia toolserver. It is a .sql file of all of the geotagged articles in the english language wikipedia (find it here). 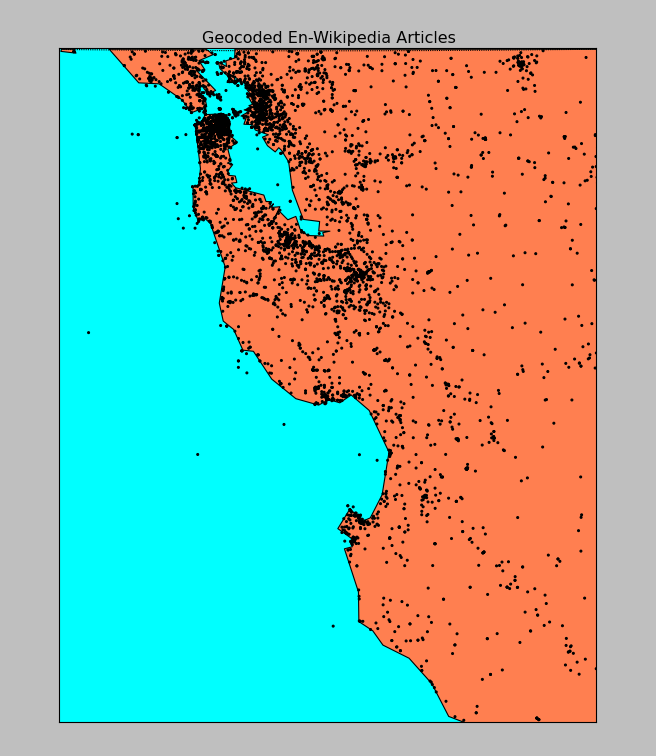 So I dumped this file into a mysql database on my computer, and sure enough, I’m able to make queries and get geographical information out! So the next step I thought would be neat was to display all of the geotagged wikipedia articles near where I live (Santa Cruz, California). I chose to use Python because it’s pretty well suited for simple hacks like this, and I can always use the practice. Interfacing Python with MySQL is easy enough using the MySQLdb package, but we have another problem: how to create maps easily in Python. After a very short amount of time searching, I found the answer: basemap. All geotagged articles near Santa Cruz, CA. Neat! So the next step for me was to try to produce a global map of wikipedia articles. After some experimentation, I found that using a heatmap would work much better than placing points, as the denser parts of the map just end up black, which isn’t very useful. 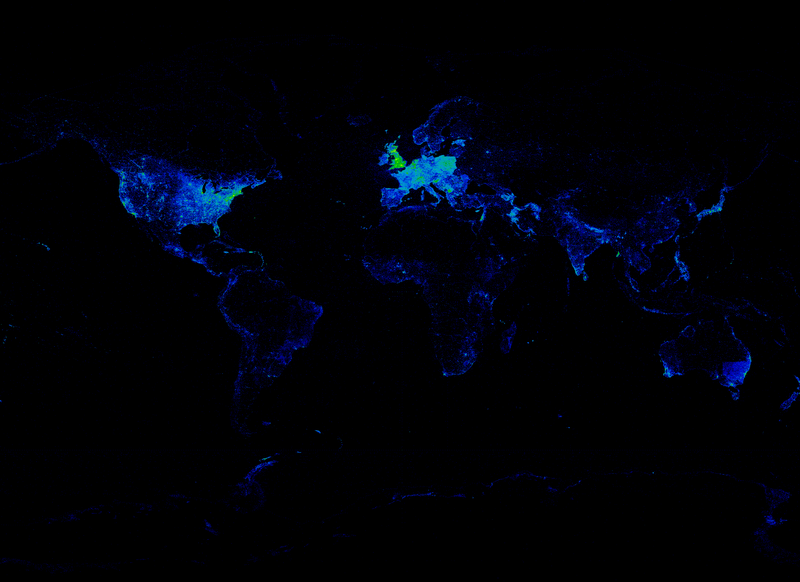 Global view of English Wikipedia articles. I’ve posted all of the sourcecode to make the heatmap above, you can find it here.